Everyone loved it and was raving about the salad instead of the Paav Bhaji. A few weeks back it happened again.. a similar menu.. and Kobichi Pachadi sidelined everything else.. then I realized that most of my friends here are not used to different styles of koshimbeers/kachumbers/Indian salads. 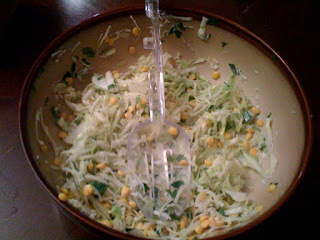 I will post other koshimbeer recipes soon..
Improvisations: Roast a corn and remove the roasted kernels. Add salt, red chili powder and lemon to it and mix well. Use this mixture instead of soaked chana daal. 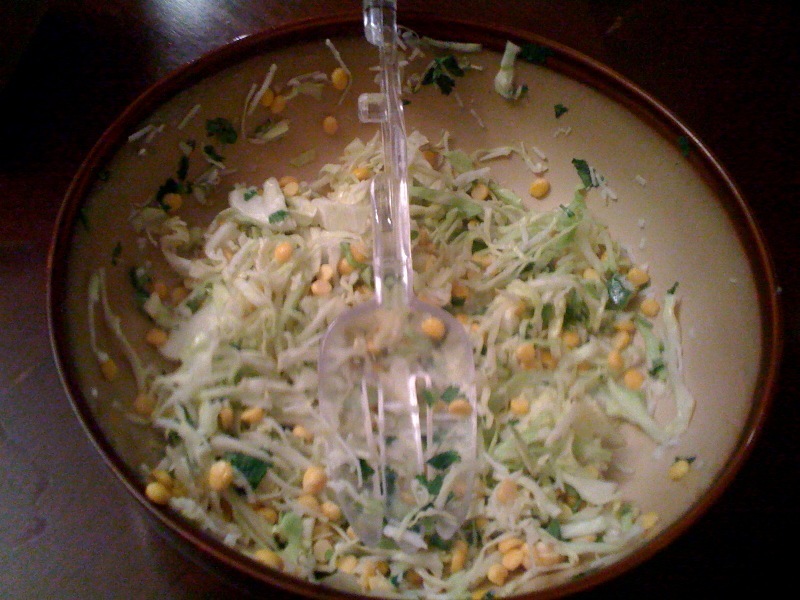 Corn-cabbage combo tastes great! Mix all the ingredients except Tadka in a bowl and add salt and sugar to taste. I love the crunch of cabbage - so I prefer this without a tadka.. but the curry leaves in the tadka add a real nice flavor.. so I'd say if you want to add tadka - add it just before serving. Tastes great with soups, and spicy preparations like Paav Bhaji..